Chrononauts #4 marks the conclusion of the fantastic time-traveling adventure miniseries and it goes out in grand style. The epic finish should make your jaw drop. 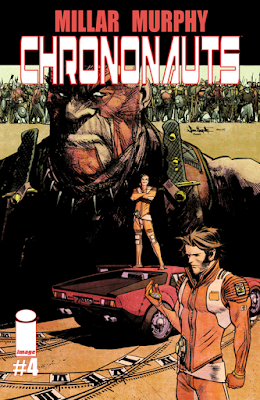 Chrononauts is the comic book version of a summer blockbuster movie. An unapologetic display of big action sequences, flawed but charismatic leading men and dinosaurs. And like a lot of blockbusters it isn't perfect but it is thoroughly entertaining. Since Corbin entered the time stream and Danny soon after him the two have been on a selfish self-indulgent tear through various eras in history, acquiring wealth and power while recklessly changing events. They soon become in over their heads when people around them figure out what they're doing leading to the two brilliant but irresponsible scientists getting captured. If that wasn't enough the people that helped send them on this journey want them back before they screw up any more of the timeline. They send their security detail to retrieve them, but the dynamic duo are basically the 'Dukes of Hazard' of time travel, outracing their pursuers through the time stream. It made for some eye-poppin' artwork from Sean Murphy as he had to illustrate every era and encapsulate an entire period within one or two panels. Lesser artists would have crumbled at such a task. Murphy is probably your Eisner award winner for penciler this year. This is Meryl Streep donning a foreign accent in an Oscar-bait film. You know she's going to kill it and Murphy kills it from the first panel to the very last. You talk about letting an artist fly by tasking him with an ever-changing location, new era-appropriate character designs and even freaking dinosaurs, Murphy nails every cinematic scene with compact brilliance. He conquered every artistic challenge Mark Millar threw at him. Colorist Matt Hollingsworth is no slouch either. The Eisner award winner has to cover the same ground as Murphy with distinctive colors for all those eras and costumes. If you're reading Wytches from Scott Snyder and Jock, you know Hollingsworth can do some eclectic visuals using an often psychedelic splatter effect. Here his colors are more straight forward but no less stunning. From the brilliance of pink and blue electricity of the first issue to the scorching hot sand of a merciless sun in the last issue, Hollingsworth paints each scene with a unique palette that is oftentimes monochromatic that helps to differentiate a new place and time. It's no wonder Chrononauts will be coming to a theater near you in the future. It's prime material to hit moviegoers with an epic time-traveling adventure full of spectacular visuals. It's what Millar does. His comic book adaptations keep coming and this might become the best one yet. It may not have a lot of depth, but it is the type of mindless summer action movie audiences will love. Danny and Corbin aren't entirely redeemed by the end, but they're likable enough to demand another volume. They mostly act as immature "bros" and reverse course rather abruptly, but it's not enough of character flaws to dismiss this entertaining series. Chrononauts #4 ends a sweeping and exciting miniseries that is short and sweet. It's a blockbuster movie wrapped in sequential art. Millar's script enables Murphy to put on a clinic on how comic art is suppose to be - fearless and fun. It's worth every penny to own.